Environmental problems need to be analysed in a comprehensive way with consideration to social justice, entitlements and fair redistribution. A boy holding a placard with a slogan: No to Shale Gas. Protest in Ain Salah, Algeria in February 2015. Photo Credit: BBOY LEE I simply don't believe in neutral discourses. My perspective is not one of academics and university people who choose to be neutral in face of injustices and oppression, and who justify this by saying they are objective in order to be accepted by the dominant discourses and other structures of power. My perspective is one of an activist, which I hope is progressive, radical, and decolonial in the sense that it is anti-systemic and resolutely in active solidarity with the oppressed and the "wretched of the earth" in their struggles to achieve social justice. I explore three themes in this article. I will start by giving an idea about the ecological and climate crises in the Maghreb region (Algeria, Morocco, and Tunisia) then go on and illustrate how the neoliberalisation of environmental governance is being enacted there. I will end by putting forward a critique of some of the concepts of ‘justice’ used to talk about the injustices of facing and dealing with environmental degradation and anthropogenic global warming. 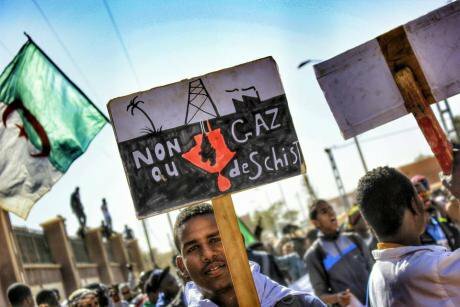 Anthropogenic climate change is a reality in the Maghreb and it is undermining the socioeconomic and ecological basis of life in the region. Tunisia, Algeria and Morocco witnessed severe heat-waves during the summer of 2015 and an ongoing drought this year, which has been catastrophic for agriculture (particularly the small peasants in Morocco). The desert is growing, eating the land around it, placing huge pressure on already-scarce water supplies. Seawater intrusion into ground water reserves, as well as groundwater overuse will put these countries in the category of those who suffer from absolute water poverty. The effects of climate change and the climate crisis are compounded by the environmental degradation and the exhaustion of natural resources caused by a productivist model of development that is based on the extractive industries: oil and gas in Algeria (and to a smaller extent Tunisia), phosphate mining, the water-intensive agribusiness model and tourism (in Tunisia and Morocco). Alongside pollution, environmental destruction and the prevalence of some diseases, I saw throughout my visits to sites of fossil-fuel and mining industries what David Harvey calls "accumulation by dispossession" and Samir Amin describes as "development of under-development". It is possible to state that the poverty in these areas is related to the existence of significant natural resources. This is the paradox of extractivism where sacrifice zones are created in order to maintain the accumulation of capital. This is the paradox of extractivism where sacrifice zones are created in order to maintain the accumulation of capital. When I say sacrifice zones, I really mean it: Ain Salah in Algeria, is one of the richest gas towns in the African continent but it is an ugly town with very poor infrastructure. The one hospital they have, they call it the "hospital of death". Gabes in Tunisia, the only coastal Mediterranean oasis in the world used to be called "a paradise on earth" before the installation of a chemical factory on its shores to process the mined phosphate. That factory has truly caused an ecocide in the oasis by pillaging its waters, polluting its air and sea and killing some of its fauna and flora. Some even talk about environmental terrorism in the current context of anti-terror discourse. What do we mean by Extractivism? It refers to those activities which remove large quantities of natural resources that are not processed (or processed to a limited degree), especially for export. Extractivism is not limited to minerals or oil. It is also present in farming, forestry, fishing and even tourism. I was appalled to see the construction of golf courses in arid and semi-arid regions in Morocco. Fanon was right all along with his critique of tourism, which he regarded as a quintessential post-colonial industry where our elites have become “the organisers of parties” for their western counterparts in the midst of overwhelming poverty. The Extractivist model of development has been in practice a mechanism of colonial and neocolonial plunder and dependency on the metropolitan centres. In all the three countries I visited, I repeatedly heard comparisons made between the ravages of post-colonial industries and the colonial ones, in some instances even suggesting that the French colonialists were more clement. To me, these comparisons and proposals are a calling into question of an internal colonialism that is dispossessing people. People in these regions have long-standing grievances and sometimes these burst into uprisings. Examples include the case of Ain Salah where people rose up massively in 2015 against the plans to frack their land and pollute their waters; and the emergence of the unemployed movement in 2013 in Ouragla, close to the oil-rich town of Hassi Messaoud; the 2008 uprising of the Gafsa mining basin and the ongoing struggle of the Imider communities against the royal holding silver mine that is grabbing their natural resources and impoverishing the area. So, in face of all these injustices and destruction, who is shaping the environmental discourse and the response to climate change in the Maghreb? Institutions like the World Bank, the German GIZ, and European Union agencies are ubiquitous and vocal, organising events and publishing reports in the three countries. They highlight some of the dangers of a warmer world, argue for urgent action, more renewable energy and adaptation plans. Given the shortage of alternatives, they seem to have comparatively radical positions when compared to the position of local governments. However, these institutions are politically aligned with the powerful. So their analysis of climate change and ecological crisis doesn't include questions of class, justice, power or colonial history. There is no reference to the historic responsibility of the industrialised west for causing climate change, of the crimes of oil companies like BP and Shell, or the climate debt owed to the Global South. The vision of the future pushed by these institutions is marked by economies subjugated to private profit and further privatisation of water, land and even the atmosphere. The latest episode in this expedition is what is called the Public Private Partnerships (PPPs) that are being pushed in every sector, including the Moroccan renewable energy plan. These privatisations that come under the rubric of "green capitalism" are also seen in the agricultural model of these countries, especially in Morocco where water-intensive, export-oriented agribusiness dominates. Such hegemonic institutions have the financial and human resources to shape and co-opt local civil societies by funding and helping to set up numerous environmental organisations. I was astonished to see the huge number of such associations and organisations that claim to be working on environmental issues in Tunisia and Morocco. To my knowledge, most of them are a-political and seek actively and sometimes opportunistically EU and foreign funding. This phenomenon sometimes referred to as an "NGOisation of the world" that is supposed to "empower the civil society" contributes to the creation of an artificial and non-independent civil society sphere, useful in deepening the marketisation and privatisation of the social. One example worth mentioning here is the emergence of some environmental mafias where some supposedly green organisations connected to real estate circles campaign to close down the chemical factory in Sfax, Tunisia, so that the land can be developed for profit. Decolonising concepts of justice: Are they applicable to the Maghreb? In the decolonial part of my work, I have attempted to deconstruct some key concepts I have been using. Based on my conversations with people in the Maghreb, the concept of ‘climate justice’ is alien and unintelligible. This is not the result of a fault with ‘orientals’ but the reason lies in the fact that this foreign concept has no roots (at least not yet) in the region. The Arabic translation sounds really weird and has no resonance with locals. Even the concept of "environmental justice" is not widely used. Western NGO’s use such concepts and others like: energy justice and democracy, food and trade justice. I even heard of cognitive justice, which sounds very intriguing. It is understandable that these NGOs come up with these terms to talk about certain issues through a justice and democracy lens in order to attract a specific audience, but I feel that there are some risks going down that path. This tendency to fragment such notions as justice and democracy could give the illusion that one can have justice (or democracy) in one field without the other and without putting into question the whole capitalist system that generates these interlinked injustices. While it is still useful to interact with and learn from movements elsewhere, we need always to contextualise concepts and discourses and look at their history. Activists, intellectuals and organisations in the Maghreb working on the issues of climate change and environmental degradation generally do not use these concepts. And in the few cases where they are used, it is the exception rather than the rule. In some instances they are imported from Europe without critical reflection and proper definitions. While it is still useful to interact with and learn from movements elsewhere, we need always to contextualise concepts and discourses and look at their history. So, do we have to rely on terms such as "climate justice" to talk about the unjust politics of dealing with climate change or do we need to rethink the concepts, give them local grounding and focus on specific issues that directly affect the livelihoods of Maghrebi people such as water scarcity, drought, industrial pollution and sovereignty over resources? I favour the latter scenario. There is always an environmental element in the struggles I document, but that dimension has been secondary to more pressing issues of socio-economic rights such as: jobs, development of the infrastructure, distribution of wealth and more inclusion in the decision-making. Therefore, environmental problems need to be analysed in a comprehensive way with consideration to social justice, entitlements and fair redistribution. How can we, we the people of the Maghreb, plan for a just transition towards renewable energies and sustainable ways of producing our food and materials when our natural resources are being plundered by multinationals and when our land and water resources are taken over by agribusiness and destructive industries? We need to fight for sovereignty and democratic control over natural resources and energy and food systems. We need to fight against land and water grabs. And strive for more transparency and against corruption in the extractive industries. In order to design and implement such a transition, we need to recapture nature from the clutches of market mechanisms and recast the debate around issues of justice, accountability and the collective good away from market logics that compartmentalise, commoditise and privatise our livelihoods and our nature.